India’s Parvati Valley is well known among travellers for its psychedelic parties and free-flowing hashish that originates from the ancient village of Malana in North India’s Himachal Pradesh region. But if you look beyond the haze, you’ll find a treasure trove of legends, intrigue and unanswered questions. Nestled in the peaks of the Himalayas, Malana is surrounded by steep cliffs and snow-capped mountains. Travellers have long been drawn to this village of nearly 1,700 inhabitants, staying for days on end amid the cold gushes of wind and rows of dark green deodar trees to consume what locals consider the holy herb and what outsiders see as a way to free the mind: the famed and award-winning Malana cream. This cannabis resin or hashish is renowned both for the hand rubbing-technique used to produce it and for its reportedly remarkable intoxicating effects. But I’d come to Malana to try to make sense of the myths surrounding the village. Legend has it that some of Alexander the Great’s army took shelter in this isolated village in 326BC after they were wounded in a battle against Porus, a ruler in India’s Punjab region. These soldiers are often said to be the ancestors of the Malani people. Artefacts from that period have been found in the village, such as a sword that reportedly rests inside the temple. However, genetic ties to the soldiers have not been studied or established. In fact, many of the locals I spoke to had no idea where this myth originated. “The big claim that Malani people have descended from Alexander the Great’s army has become a widely accepted truth, but I have not found any real backing to it. There are some weapons and other things that can be found that have raised these links, but I am certain that there is no evidence to this story,” said Amlan Datta, a filmmaker who has spent a decade working in Malana. But these theories are fuelled by locals’ noticeably different physical features and their language, which are unlike that of any other local tribe, adding to the enigma surrounding the Malanis and their identity. They speak Kanashi, which is considered sacred and is not taught to outsiders. It is also spoken nowhere else in the world. During my visit, I referred to some of the men I met as ‘Bhaiji’ (a polite way of saying brother), which is a fairly common way to address men in Himachal. Though locals understood when I spoke to them in Hindi, their responses in Kanashi were incomprehensible to me. Even getting to Malana was a journey into the unknown. There are no motorable roads to the village, and it took me about four hours to trek there from the village of Jari at the bottom of the Parvati Valley. The approach was steep yet breath-taking. It wasn’t long before I started passing Malani people – distinguishable by their light brown hair, light brown eyes, long noses and a distinct wheatish or a golden-brownish complexion of skin – most of whom were traditionally dressed in light brown robes, caps and hemp shoes. To me, they looked more Mediterranean than Himachali. As I entered the village, I came to a group of teenagers who casually inquired whether I was interested in buying some hashish. Though cannabis has long been the backbone of this small village’s economy, it has led to a host of socio-cultural issues, such as young children being involved in the drug trade. This is perhaps why, one year ago, the village deity Jamdagni Rishi – who is locally nicknamed the Jamlu Devta and is a great sage in Hindu mythology – decreed through his spiritual spokesperson (the Gur) that all guesthouses across the village would be shut, leaving the village open to outsiders only during the day. Jamlu Devta is an important figurehead in village governance, a political set-up that has long baffled researchers and visitors who cannot comprehend how such an advanced form of governance exists in this quaint and remote Himalayan village. Malana’s unique democratic system is said to be among the oldest in the world, and, similar to the Ancient Greek system of democracy, it consists of a lower house and upper house. However, it has a uniquely spiritual twist to it: ultimate rulings rest on the upper court, which includes three important figures, of which one is the representative of the local deity, Jamlu Devta. “Devta is the ultimate word and we have a set-up of a council and three political figures of sorts, one of whom – the Gur, or the vessel who is possessed by Jamlu – communicates to us the decisions of Jamlu Devta,” explained Rohan, one of the hashish-dealing teenagers. Datta had told me about a local legend that said Jamlu Devta once inhabited Malana, which he was gifted by the Hindu god Shiva. There are two temples in the village, one dedicated to him and the other, to his wife, Renuka Devi. As I walked through the narrow passageways of this ancient village, dotted with wooden and brick houses, I entered the large courtyard, where the lower court gathers, and a temple dedicated to Jamlu Devta. It was sight to behold against a backdrop of snow-capped mountains. The temple, with wide wooden pillars, intricate doors and a host of bones, skulls and other sacrificial animal parts on one wall looked intriguing. But there was a warning sign outside demanding INR 3,500 ‘On touching of this holy place of Jamdagni Rishi’. This sign is an outward demonstration of another tradition that is very apparent in Malana: a quest to preserve the ‘purity’ of the village. People across Himachal Pradesh will tell you that the Malanis are known to restrict contact with outsiders, particularly in terms of direct physical contact. I personally had been warned to keep my distance by the driver who had brought me to Jari earlier that day. Although I did see some of the younger generations hugging or shaking hands, most people here still strongly hold the taboo of touching outsiders. When I went to pay for a bottle of water, the shopkeeper asked me to leave the notes on the counter instead of handing them to him directly. I also learned that marriages must take place within the village; transgression of this norm invites social boycott. Well aware that outsiders aren’t welcome here, I felt like an intruder as I kept probing people to find out more information about the village. Himachali people in general are warm and chatty, and they love to share stories and meals with visitors; in Malana, however, long conversations with locals were rare. Descending from the hills and coming down from this otherworld, I acknowledged my position as a traveller who would forever be on the outside of this mysterious Himalayan hamlet. Whether I liked it or not, the locals hadn’t taken me in, and I needed to respect their culture. But now, weeks later, as I look back on my quest to unfold the legends of Malana, I have come to the realisation that the very beauty of my experience was based on the essence of mystery, the unknown. Cherishing that very quality of Malana finally has led me to a newfound appreciation of this strange, cold land of enigmatic people. Smack in the middle of the Atlantic Ocean, atop an underwater mountain rising over 10,000 feet above the seafloor, sits Lost City. Hundreds of white spires jut into the dark ocean, spanning the area of a city block and towering between 30 and 200 feet tall. Hot alkaline fluids filled with hydrogen gas spew from the tops of these natural towers into the waters just east of the Mid-Atlantic Ridge. 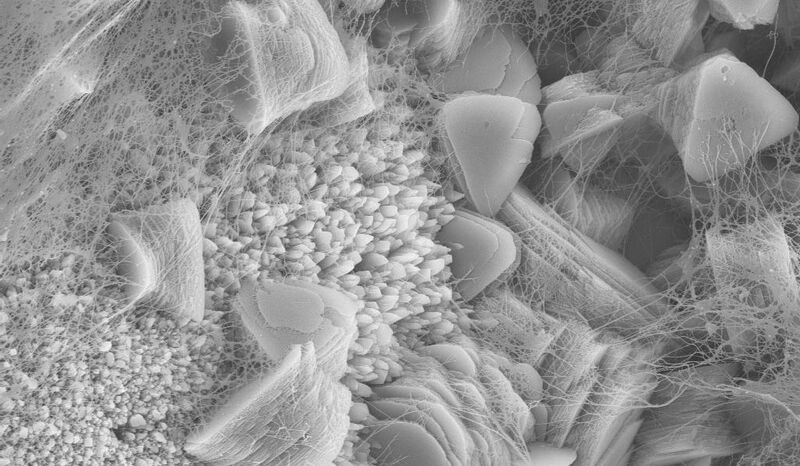 What looks like a long-abandoned metropolis is, in fact, teeming with microscopic life. The trillions of microbial residents of Lost City, perched on top of the Atlantis Massif, have become a fascination for scientists. These microbes, thriving in a hydrothermal vent field deep in the Atlantic, hold the secret to life’s survival in such hostile environments—and they may even provide clues about the origins of life on Earth. Tomorrow, September 8, a group of 22 researchers, microbiologists, geologists and oceanographers, will travel to Lost City for the first time in years. This group of scientists wants to know how the microbes of Lost City make their living, what they eat and breathe, and how they survive in the extreme temperatures and pressures of the deep ocean. “We want to know how they’re living there,” says team co-lead William Brazelton, a microbiologist at the University of Utah. Discovered in 2000, Lost City is one of only a few known places like it on the planet. 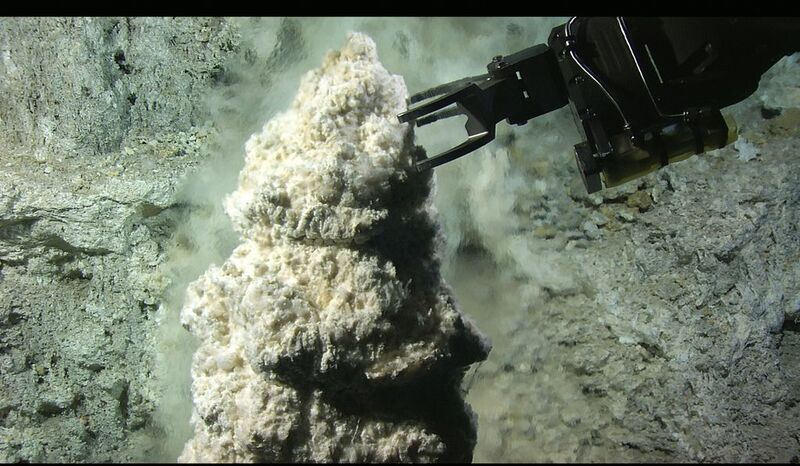 Unlike more common types of hydrothermal vents, such as black smokers and methane seeps, Lost City is not fueled by volcanic activity. Rather, the vents are created when seawater encounters rock from the Earth’s mantle, creating gas and energy in a process known as serpentinization. Calcium-rich water from these vents then reacts with carbon in the seawater to form Lost City’s iconic carbonate chimneys. Hydrogen gas spewing from the chimneys provides an ample energy source for the microbes living in Lost City. “It’s the closest thing to a free lunch the universe provides,” Brazelton says. The chimneys also release methane, an organic molecule which is a rich source of energy for many types of life. While energy is abundant, it’s not yet clear where microbes in this deep-sea ecosystem get their carbon or nutrients. According to team co-lead Susan Lang, a geochemist at the University of South Carolina, solving this mystery is one of the primary missions of the expedition. Jason will collect sediment from the seafloor and extract small samples of Lost City chimneys, but mostly, Jason will be collecting water. The expedition scientists plan to collect water streaming out of the chimneys to capture microbes that live deep within the Atlantis Massif. The researchers hypothesize that microbes within the mountain introduce carbon and nutrients to the ecosystem, which enables microbial life on the surface of the chimneys. Determining how microbes survive within the mountain, where inhospitable conditions surround the serpentinization process, could also give a glimpse of possible life on other planets. 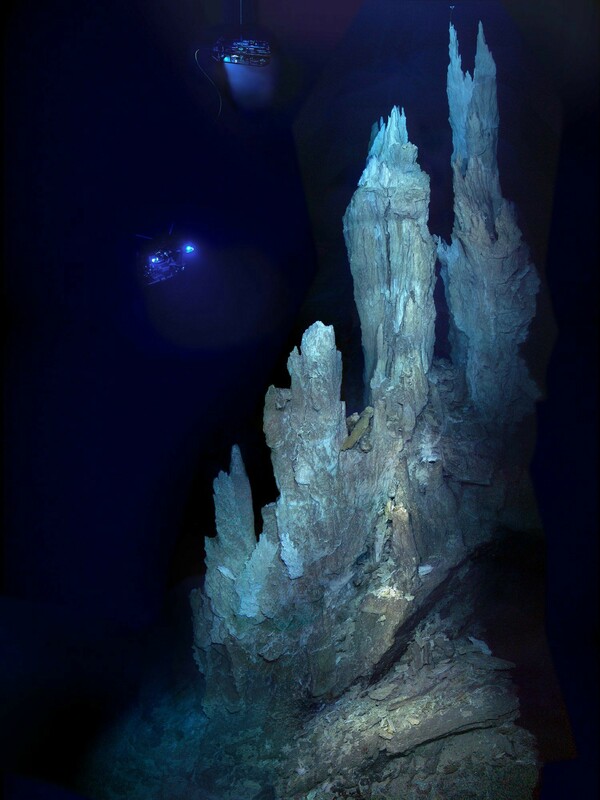 Because the ingredients are relatively simple (rock and seawater), and the environment is oxygen-free, microbes within the Atlantis could be a window to extraterrestrial lifeforms. 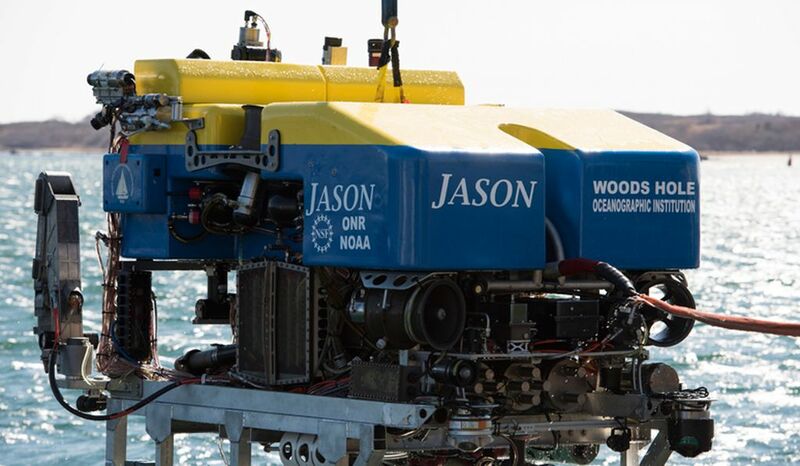 The ROV Jason will collect around 30 liters of seawater every day. Some of the collected water will be stored in freezers for future research, while some will be analyzed on the spot to measure chemical composition as well as microbe and virus populations. Over the next years, genetic testing of the seawater samples will illuminate what kinds of microbes live in this extreme environment and how they manage to survive. There are also scientists who believe that Lost City, or a place like it, may be where life started on Earth. “It’s a good system for where early life may have developed,” Lang said. Small pores in the walls of Lost City chimneys, combined with basic (as opposed to acidic) seawater and an unlimited energy source in the hydrogen gas, could provide the Goldilocks conditions needed for spontaneous life. “The geochemistry and geology at Lost City appear to come together in a way that would resolve the energetic chicken-and-egg problem of life’s origin,” said Jeffrey Marlow, a microbiologist at Harvard University who is not involved in the expedition. The “chicken-and-egg” problem refers to the fact that a cell needs energy to create bio-molecules, and bio-molecules are needed to harness energy. Marlow thinks it’s plausible that the high-pH water swirling into chimney pores at Lost City could generate favorable conditions for life to begin. The hydrogen gas and other molecules mixing together in the pores may create a pre-cursor to a cell, known as a proto-cell. Finding another Lost City soon seems unlikely considering most of the ocean has never been explored by humans. “We’ve only seen a tiny fraction of the seafloor,” Marlow says. “There’s so much more out there to be discovered.” According to the United States National Ocean Service, less than 20 percent of the ocean has been mapped or observed by humans. 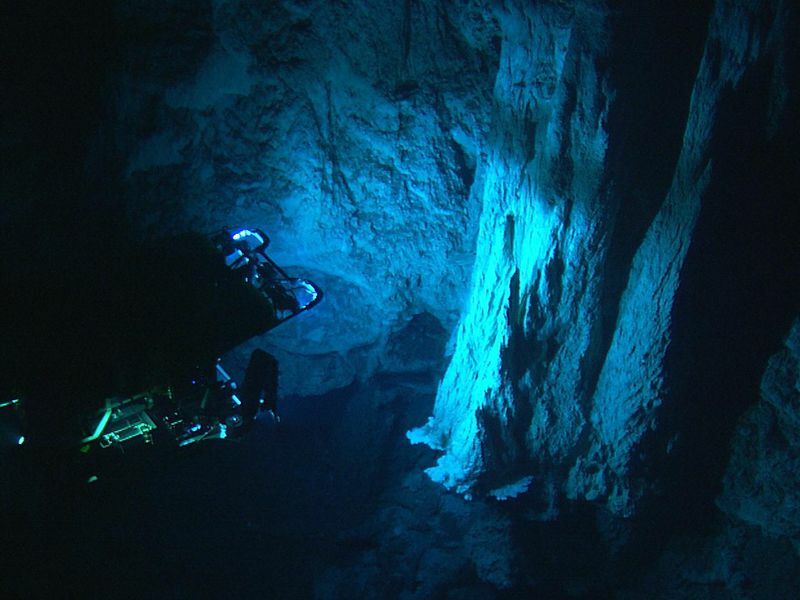 The deep ocean is as much a frontier for scientists as deep space. Researchers are just beginning to understand how diverse life functions in extreme ecosystems near the seafloor, and scientists aren’t the only ones looking to the deep sea. Mineral resources, like nickel, cobalt, silver and gold, have piqued the interest of mining companies, who are increasingly investing in future deep-sea exploitation. “When I was a student learning about the deep sea, the idea that there are minerals on the seafloor that industries might want to mine was totally a sci-fi idea because it was not economically viable at all,” Orcutt said. But now, the required technologies are here, and the International Seabed Authority (the United Nations agency that gives permission for mining in international waters) gives out permits for mining exploration every year. One such permit, issued in August 2017, gave Poland the right to exploit the area of seafloor where Lost City is located. This month’s expedition to Lost City will help us learn a little bit more about the mysterious worlds below. 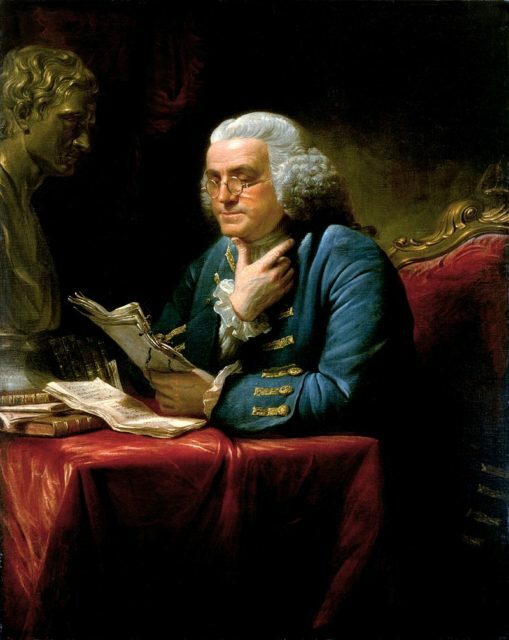 In 1778, Founding Father Benjamin Franklin was in France attempting to secure support for the United States Colonies during the War for Independence. Great Britain and France had been at odds with one another for many years as the two most powerful nations in the world. The American Continental Congress knew that enlisting aid from France would further infuriate King George III. The Americans were fully aware they could not win the war with Great Britain alone. 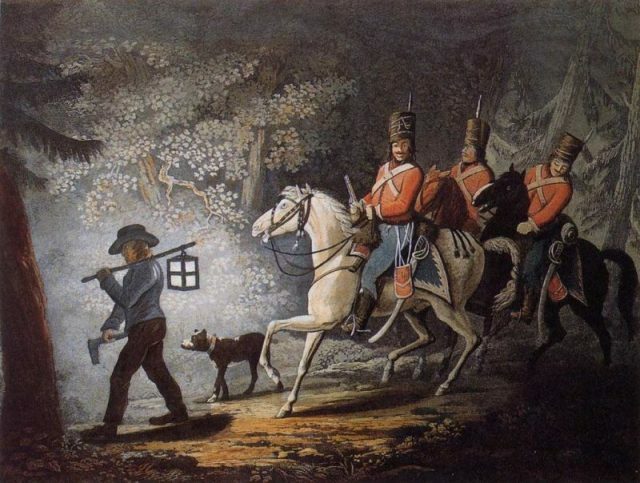 They had no navy, and military supplies such as guns and ammunition were hard to come by as the Colonies depended on Great Britain for most of their supplies. The British had recruited North American Indian tribes to fight for their cause — promising if Britain retained control of the Colonies, the Native Americans would be left alone. The only hope the Colonists had was to enlist foreign aid. The Colonies were forbidden to trade with foreign countries, but smuggling had been going on for years. American rice and tobacco were to be shipped only to Britain but were secretly shipped to northwestern France and Amsterdam in exchange for much-needed items such as tea, fabric for clothing, gunpowder, arms, wig powder and other necessities. Great Britain was aware of the illegal trading but mostly ignored the situation until they found out about the weapons and gunpowder. In 1774, the British sent ships to Texel Island in northern Holland to curtail the trade with Amsterdam. According to Aermican Herritage by the beginning of 1775, the British had unknowingly sent almost six million dollars’ worth of war munitions to the Colonies. At the age of seventy-one Benjamin Franklin was sent to France, along with Silas Deane and Arthur Lee, to gain help from Louis XVI. On May 2, 1776, the French King signed documents making France an American ally which dishonored her treaties with Britain. 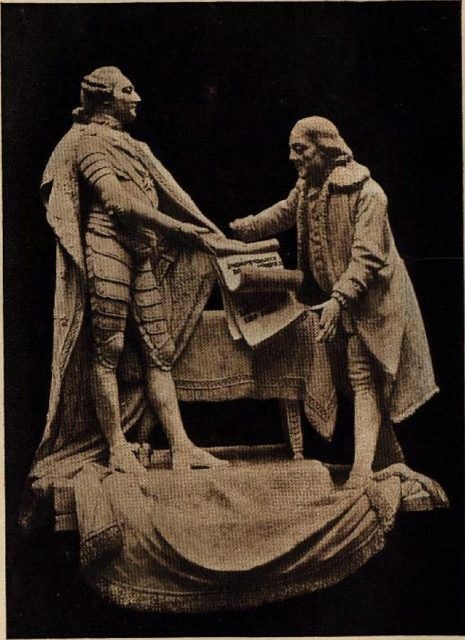 In 1770 Massachusetts appointed Franklin as the first foreign ambassador to France. By 1778, Franklin, Deane and Lee had negotiated the Treaty of Alliance and the Treaty of Amity and Commerce with their new ally. 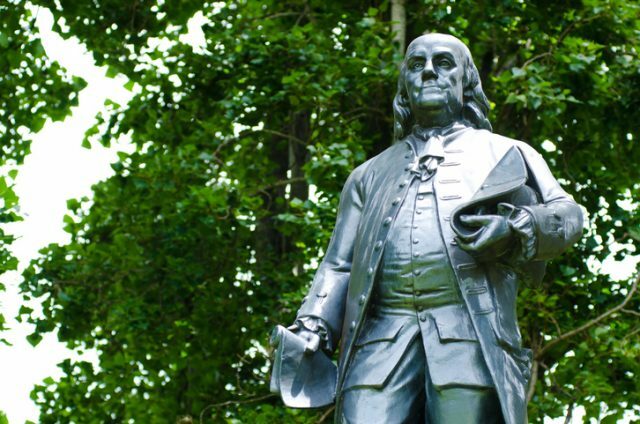 Franklin had already proved his worth in the Colonies by his writings, inventions, research of electricity, and his brilliant use of diplomacy. Although he was self-taught, Franklin held honorary degrees from Harvard, Yale, the University of St. Andrews in Scotland, and Oxford University in England. He also helped found the University of Pennsylvania in his hometown of Philadelphia. The French, fascinated by Franklin, welcomed him with open arms. He learned French and was set up in a house in the Parisian suburb of Passy. His charm, wit and humble dress made him one of the most popular people in Paris. He wore a coonskin cap to play up the French belief that Americans were wild frontiersmen. 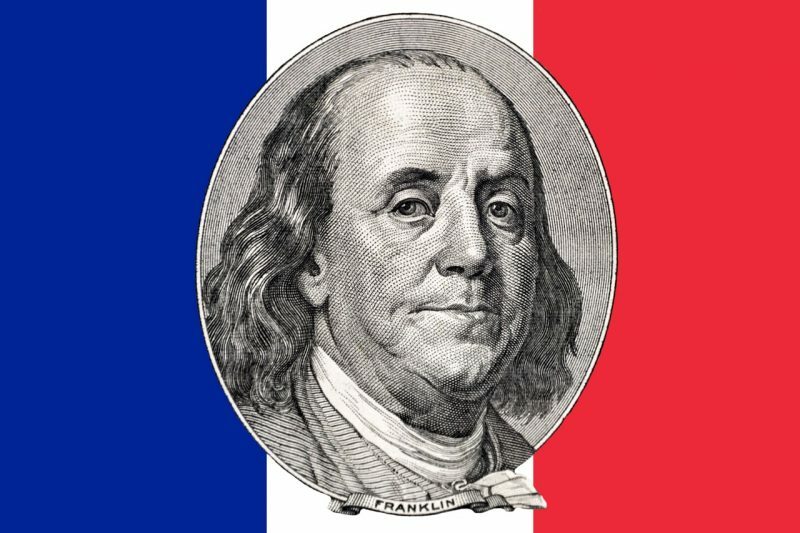 In fact, Franklin was so popular in France that even today some French citizens think he was an American president. 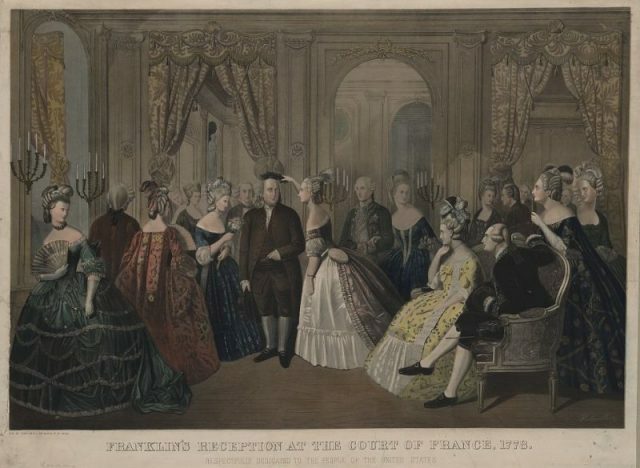 Franklin was criticized by his contemporaries for living the high life, going to balls and parties and hobnobbing with the wealthiest of society. For Franklin to have mixed with the poorer people would have alienated him from the king and wealthy potential donors to the cause. It was the eve of the French Revolution, and the public had had about enough of squalid living conditions while the wealthy flaunted their money in over the top decadence. At the end of the Revolutionary War Franklin successfully negotiated the Treaty of Paris in 1783. Having spent about ten years in France, Franklin returned to Philadelphia in 1785. He assisted in the creation of both the Bill of Rights and the United States Constitution. Alas, the inscription on his headstone in Christ Church Burial Ground reads “Benjamin and Deborah Franklin 1790.” The Poor Richard Club mounted a plaque near the grave with Franklin’s epitaph for himself and another with a timeline of Franklin’s life. Ibn Baṭṭūṭah, in full Abū ʿAbd Allāh Muḥammad ibn ʿAbd Allāh al-Lawātī al-Ṭanjī ibn Baṭṭūṭah, (born February 24, 1304, Tangier, Morocco—died 1368/69 or 1377, Morocco), the greatest medieval Muslim traveler and the author of one of the most famous travel books, the Riḥlah (Travels). His great work describes his extensive travels covering some 75,000 miles (120,000 km) in trips to almost all of the Muslim countries and as far as China and Sumatra (now part of Indonesia). Ibn Baṭṭūṭah was from a family that produced a number of Muslim judges (qadis). He received the traditional juristic and literary education in his native town of Tangier. In 1325, at the age of 21, he started his travels by undertaking the pilgrimage(hajj) to Mecca. At first his purpose was to fulfill that religious duty and to broaden his education by studying under famous scholars in Egypt, Syria, and the Hejaz (western Arabia). That he achieved his objectives is corroborated by long enumerations of scholars and Sufi (Islamic mystic) saints whom he met and also by a list of diplomas conferred on him (mainly in Damascus). Those studies qualified him for judicial office, whereas the claim of being a former pupil of the then-outstanding authorities in traditional Islamic sciences greatly enhanced his chances and made him thereafter a respected guest at many courts. Ibn Baṭṭūṭah’s voyagesThe voyages of Ibn Baṭṭūṭah. Encyclopædia Britannica, Inc.
That renown was to follow later, however. In Egypt, where he arrived by the land route via Tunis and Tripoli, an irresistible passion for travel was born in his soul, and he decided to visit as many parts of the world as possible, setting as a rule “never to travel any road a second time.” His contemporaries traveled for practical reasons (such as trade, pilgrimage, and education), but Ibn Baṭṭūṭah did it for its own sake, for the joy of learning about new countries and new peoples. He made a living of it, benefitting at the beginning from his scholarly status and later from his increasing fame as a traveler. He enjoyed the generosity and benevolence of numerous sultans, rulers, governors, and high dignitaries in the countries he visited, thus securing an income that enabled him to continue his wanderings. From Cairo, Ibn Baṭṭūṭah set out via Upper Egypt to the Red Sea but then returned and visited Syria, there joining a caravanfor Mecca. Having finished the pilgrimage in 1326, he crossed the Arabian Desert to Iraq, southern Iran, Azerbaijan, and Baghdad. There he met the last of the Mongol khans of Iran, Abū Saʿīd (ruled 1316–36), and some lesser rulers. Ibn Baṭṭūṭah spent the years between 1327 and 1330 in Mecca and Medinaleading the quiet life of a devotee, but such a long stay did not suit his temperament. Embarking on a boat in Jiddah, he sailed with a retinue of followers down both shores of the Red Sea to Yemen, crossed it by land, and set sail again from Aden. This time he navigated along the eastern African coast, visiting the trading city-states as far as Kilwa (Tanzania). His return journey took him to southern Arabia, Oman, Hormuz, southern Persia, and across the Persian Gulf back to Mecca in 1332. There a new, ambitious plan matured in his mind. Hearing of the sultan of Delhi, Muḥammad ibn Tughluq (ruled 1325–51), and his fabulous generosity to Muslim scholars, he decided to try his luck at his court. Forced by lack of communications to choose a more indirect route, Ibn Baṭṭūṭah turned northward, again passed Egypt and Syria, and boarded ship for Asia Minor (Anatolia) in Latakia. He crisscrossed that “land of the Turks” in many directions at a time when Anatolia was divided into numerous petty sultanates. Thus, his narrative provides a valuable source for the history of that country between the end of the Seljuq power and the rise of the house of Ottoman. Ibn Baṭṭūṭah was received cordially and generously by all the local rulers and heads of religious brotherhoods (ākhīs). His journey continued across the Black Sea to the Crimean Peninsula, then to the northern Caucasus and to Saray on the lower Volga River, capital of the khan of the Golden Horde, Öz Beg (ruled 1312–41). According to his narrative, he undertook an excursion from Saray to Bulgary on the upper Volga and Kama, but there are reasons to doubt his veracity on that point. On the other hand, the narrative of his visit to Constantinople (now Istanbul) in the retinue of the khan’s wife, a Byzantine princess, seems to be an eyewitness record, although there are some minor chronological discrepancies. Ibn Baṭṭūṭah’s description of the Byzantine capital is vivid and, in general, accurate. Although he shared the strong opinions of his fellow Muslims toward unbelievers, his account of the “second Rome” shows him as a rather tolerant man with a lively curiosity. Nevertheless, he always felt happier in the realm of Islam than in non-Muslim lands, whether Christian, Hindu, or pagan. After his return from Constantinople through the Russian steppes, he continued his journey in the general direction of India. From Saray he traveled with a caravan to Central Asia, visiting the ancient towns of Bukhara, Samarkand, and Balkh, all of those still showing the scars left by the Mongol invasion. He took rather complicated routes through Khorāsān and Afghanistan, and, after crossing the Hindu Kush mountain range, he arrived at the frontiers of India on the Indus River on September 12, 1333, by his own dating. The accuracy of that date is doubtful, as it would have been impossible to cover such enormous distances (from Mecca) in the course of only one year. Because of that discrepancy, his subsequent dating until 1348 is highly uncertain. By that time Ibn Baṭṭūṭah was already a man of some importance and fame, with a large train of attendants and followers and also with his own harem of legal wives and concubines. India and its ruler, Muḥammad ibn Tughluq, lived up to Ibn Baṭṭūṭah’s expectations of wealth and generosity, and the traveler was received with honours and gifts and later appointed grand qadi of Delhi, a sinecure that he held for several years. Though he had apparently attained an easy life, it soon became clear that his new position was not without danger. Sultan Muḥammad, an extraordinary mixture of generosity and cruelty, held sway over the greater part of India with an iron hand that fell indiscriminately upon high and low, Muslim and Hindu alike. Ibn Baṭṭūṭah witnessed all the glories and setbacks of the sultan and his rule, fearing daily for his life as he saw many friends fall victim to the suspicious despot. His portrait of Muḥammad is an unusually fine piece of psychological insight and mirrors faithfully the author’s mixed feelings of terror and sympathy. Notwithstanding all his precautions, Ibn Baṭṭūṭah at last fell into disgrace, and only good fortune saved his life. Gaining favour again, he was appointed the sultan’s envoy to the Chinese emperor in 1342. He left Delhi without regrets, but his journey was full of other dangers: not far away from Delhi his party was waylaid by Hindu insurgents, and the traveler barely escaped with his life. On the Malabar Coast of southwestern India he became involved in local wars and was finally shipwrecked near Calicut (now Kozhikode), losing all his property and the gifts for the Chinese emperor. Fearing the wrath of the sultan, Ibn Baṭṭūṭah chose to go to the Maldive Islands, where he spent nearly two years; as a qadi, he was soon active in politics, married into the ruling family, and apparently even aspired to become sultan. Finding the situation too dangerous, he set out for Sri Lanka, where he visited the ruler as well as the famous Adam’s Peak. After a new shipwreck on the Coromandel Coast of southeastern India, he took part in a war led by his brother-in-law and went again to the Maldives and then to Bengal and Assam. At that time he decided to resume his mission to Chinaand sailed for Sumatra. There he was given a new ship by the Muslim sultan and started for China; his description of his itinerary contains some discrepancies. He landed at the great Chinese port Zaytūn (identified as Quanzhou, near Xiamen [Amoy]) and then traveled on inland waterways as far as Beijing and back. That part of his narrative is rather brief, and the itinerary, as well as the chronology, presents many problems and difficulties, not yet surmounted, that cast shadows of doubt on his veracity. Equally brief is his account of the return voyage via Sumatra, Malabar, and the Persian Gulf to Baghdad and Syria. In Syria he witnessed the ravages of the Black Death of 1348, visited again many towns there and in Egypt, and in the same year performed his final pilgrimage to Mecca. At last he decided to return home, sailing from Alexandria to Tunisia, then to Sardinia and Algiers, finally reaching Fès, the capital of the Marīnid sultan, Abū ʿInān, in November 1349. But there still remained two Muslim countries not yet known to him. Shortly after his return he went to the kingdom of Granada, the last remnant of Moorish Spain, and two years later (in 1352) he set out on a journey to the western Sudan. His last journey (across the Sahara to Western Africa) was taken unwillingly at the command of the sultan. Crossing the Sahara, he spent a year in the empire of Mali, then at the height of its power under Mansa Sulaymān; his account represents one of the most important sources of that period for the history of that part of Africa. Toward the end of 1353 Ibn Baṭṭūṭah returned to Morocco and, at the sultan’s request, dictated his reminiscences to a writer, Ibn Juzayy (died 1355), who embellished the simple prose of Ibn Baṭṭūṭah with an ornate style and fragments of poetry. After that he passes from sight. He is reported to have held the office of qadi in a town in Morocco before his death, details of which remain uncertain. It has been suggested that he died in 1368/69 or 1377 and was buried in his native town of Tangier. The claim of Ibn Baṭṭūṭah to be “the traveler of Islam” is well founded: it is estimated that the extent of his wanderings was some 75,000 miles (120,000 km), a figure hardly surpassed by anyone before the age of steam power. He visited, with few exceptions (central Persia, Armenia, and Georgia), all Muslim countries, as well as many adjacent non-Muslim lands. While he did not discover new or unknown lands, and his contribution to scientific geography was minimal, the documentary value of his work has given it lasting historical and geographical significance. 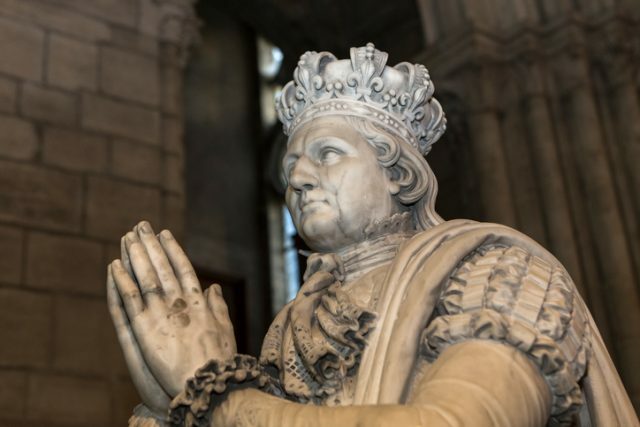 He met at least 60 rulers and a much greater number of viziers, governors, and other dignitaries; in his book he mentioned more than 2,000 persons who were known to him personally or whose tombs he visited. The majority of those people are identifiable by independent sources, and there are surprisingly few errors in names or dates in Ibn Baṭṭūṭah’s material. His Riḥlah, as his book is commonly known, is an important document shedding light on many aspects of the social, cultural, and political history of a great part of the Muslim world. Ibn Baṭṭūṭah was a curious observer interested in the ways of life in various countries, and he described his experiences with a human approach rarely encountered in official historiography. His accounts of his travels in Asia Minor, East and West Africa, the Maldives, and India form a major source for the histories of those areas, whereas the parts dealing with the Arab and Persian Middle East are valuable for their wealth of detail on various aspects of social and cultural life. On the whole, Ibn Baṭṭūṭah is reliable; only his alleged journey to Bulgary was proved to be invented, and there are some doubts concerning the East Asian part of his travels. A few grave and several minor discrepancies in the chronology of his travels are due more to lapses in his memory than to intentional fabrication. A number of formerly uncertain points (such as travels in Asia Minor and the visit to Constantinople) have since been cleared away by contemporary research and the discovery of new corroborative sources. Another interesting aspect of the Riḥlah is the gradual revealing of the character of Ibn Baṭṭūṭah himself; in the course of the narrative the reader may learn the opinions and reactions of an average middle-class Muslim of the 14th century. He was deeply rooted in orthodox Islam but, like many of his contemporaries, oscillated between the pursuit of its legislative formalism and an adherence to the mystic path and succeeded in combining both. He did not offer any profound philosophy but accepted life as it came to him, leaving to posterity a true picture of himself and his times. In 1963 Alfred Hitchcock released The Birds, one of his most iconic thrillers. The movie considered what would happen if flocks of birds, animals that linger in the background of many of our daily lives, suddenly rose up and attacked a small coastal town in California. The film was inspired by a real-life event, namely an attack by sooty shearwaters on Capitola, California, in 1961. It was linked to diatompoisoning of the anchovies eaten by the birds. The shearwaters crashed into rooftops, and their carcasses were found on the streets and throughout the town. Movies like The Birds (1963) or The Happening (2008) that explore the possibility of nature suddenly becoming vindictive pop into theaters from time to time, but the prospect of injuries and even deaths caused by aggressive birds is not fiction. Territoriality and defending young from predators remains serious business, and even the smallest birds will lash out at threats. The list below highlights some of the world’s most dangerous birds. Cassowaries are the only members of the family Casuariidae and belong to the order Casuariiformes, which also includes the emu. Three species (counted by some experts as six), each with several races, live in habitats that span parts of Australia and New Guinea. The cassowary has been known to kill human beings with slashing blows of its feet, as the innermost of its three toes bears a long daggerlike nail. The bird has been observed moving rapidly along narrow tracks in the bush, sprinting as fast as 50 km (31 miles) per hour. Cassowaries are curious, and they do attack from time to time, but attacks on humans are relatively rare. Those attacks that do occur overwhelmingly involve soliciting food from people. One of the most recent incidents came in 2012, when a tourist in Queensland, Australia, was kicked by a cassowary off a ledge and into a body of water but remained unharmed otherwise. 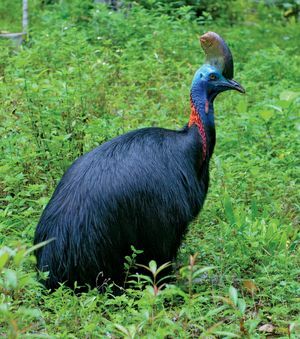 One of the most famous attacks (and the only one known to result in a confirmed death) occurred in 1926: one member of a group of teenaged boys hunting cassowaries was killed after a cassowary leapt upon him while he was on the ground. The bird slashed the boy’s jugular vein with its long toenail. 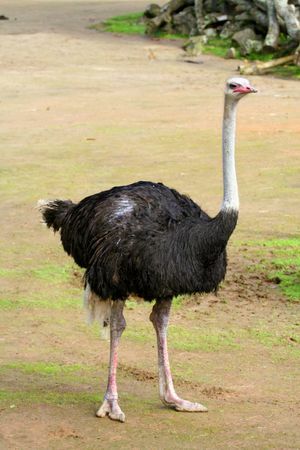 Ostriches are flightless birds found only in open country in Africa. The largest living birds, adult males may be 2.75 meters (about 9 feet) tall—almost half of that height being in the neck—and weigh more than 150 kilograms (330 pounds). Ostriches are seen individually, in pairs, in small flocks, or in large aggregations, depending on the season. The ostrich relies on its strong legs—uniquely two-toed, with the main toe developed almost as a hoof—to escape its enemies, chiefly humans and the larger carnivores. A frightened ostrich can achieve a speed of 72.5 kilometers (45 miles) per hour. If cornered, it can deliver dangerous kicks capable of killing lions and other large predators. Deaths from kicks and slashes are rare, with most attacks resulting from humans provoking the birds. One of the most interesting ostrich-attack stories involved the American musician Johnny Cash, who kept an exotic animal park with ostriches on his property. Cash encountered an aggressive male ostrich several times during his walks in the woods in 1981. On one occasion, Cash brandished a 6-foot stick and swung it at the bird, who dodged the swipe and slashed at Cash with its foot. Cash noted that the blow struck him in the stomach, and if it weren’t for a strong belt buckle, he said that the ostrich’s toe claw would have cut his abdomen open and killed him. The common emu, the only survivor of several forms exterminated by settlers, is stout-bodied and long-legged like its relative the cassowary. Emus can dash away at nearly 50 km (30 miles) per hour; if cornered, they kick with their big three-toed feet. Like cassowaries and ostriches, the toe claws of emus are capable of eviscerating animals under the right conditions; however, human fatalities are extremely rare. 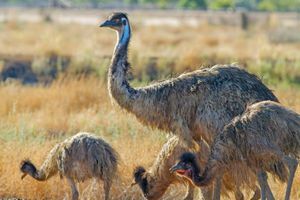 Reports of emu attacks resulting in a range of injuries in Australia and in wild-animal parks, emu farms, and zoos across the world are not uncommon, with more than 100 occurring in 2009 alone. 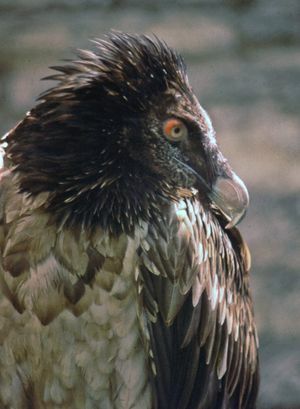 Paul Johnsgard—Root Resources/Encyclopædia Britannica, Inc.
Lammergeiers, which are also called bearded vultures, are big eaglelike vultures of the Old World (family Accipitridae). These birds often reach lengths of more than 1 meter (40 inches), with a wingspread of nearly 3 meters (10 feet). They inhabit mountainous regions from Central Asia and eastern Africa to Spain and dine on carrion, especially bones, which they drop from heights as great as 80 meters (260 feet) onto flat rocks below. This cracks open the victim’s bones and allows the birds access to the marrow. Attacks on humans are either rare or even anecdotal; however, the Athenian dramatist Aeschylus is said to have died at Gela (on Sicily’s south coast) when a lammergeier dropped a tortoise on his bald head after mistaking it for a stone. Although Aeschylus did die at Gela, experts believe that the story describing the strange cause of his death was fabricated by a later comic writer. Owls of all kinds have been known to attack people when defending their young, their mates, or their territories. Frequent targets include unsuspecting joggers and hikers. Often victims escape without injury, and deaths from owl attacks are extremely rare. 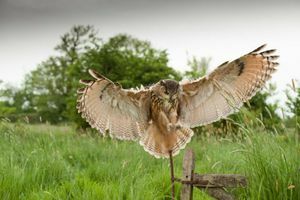 Great horned owls (Bubo virginianus) and barred owls (Strix varia), in particular, have received attention from high-profile attacks. In 2012 a number of people in a Seattle-area park reported being attacked by a great horned owl that swooped down from the trees. A similar swooping attack occurred in Salem, Oregon, in 2015 when a great horned owl repeatedly struck the scalp of a jogger, who ran and later escaped. Great horned owls are powerful predators that often grow to more than 2 feet (60 cm) in length, with wingspans that often approach 200 cm (80 inches). These owls, which are found across the Americas, usually eat small rodents and birds but have been known to carry off larger prey. The clutching force of their talons can be as strong as 500 psi (which is similar to the bite of a large guard dog and thus great enough to permanently disfigure, blind, or kill). Great horned owls, like most owl species, tend to concentrate on the face and head in battles with larger animals. 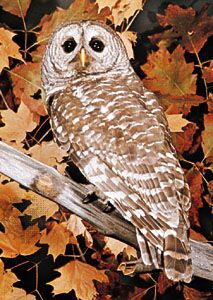 Barred owls, whose habitat includes much of the eastern United States and southeastern Canada, are smaller than great horned owls. They weigh between 630 and 800 grams (1.4 to 1.8 pounds) and have a wingspan of about 110 cm (43 inches). Attacks by barred owls on hikers have been reported from Texas to British Columbia. A barred owl was thought to have played a part in a bizarre high-profile North Carolina murder case. In 2003 a man was convicted of murdering his second wife with a fireplace blow poke. In 2011, after the man had served several years in prison, a judge tossed out the forensic evidence related to the murder weapon. Shortly thereafter, news of barred-owl attacks in the Pacific Northwest, combined with a reexamination of the wounds on the victim’s scalp, face, and wrists, prompted the defendant’s attorneys to suggest that a barred owl was to blame for the victim’s death. The defense argued that the victim, who was under the influence of pain medication and alcohol at the time, was attacked by a barred owl in her front yard. The owl had become entangled in the victim’s hair and continued to scratch and peck before the victim was able to fight it off and free it as she ran into the house. After climbing the stairs to the second floor, the attorneys suggested that the victim had then fallen backwards down the stairs to her death, breaking her neck. In 2017 the defendant plead guilty to voluntary manslaughter, which allowed him to maintain his innocence. Why Is There an R in Mrs.? While mistress may have distasteful connotations today, in the mid-18th century the title referred to a woman of economic or social capital. Mrs. was an honorific: a woman referred to as Mrs. generally had servants or was part of an upper social echelon. 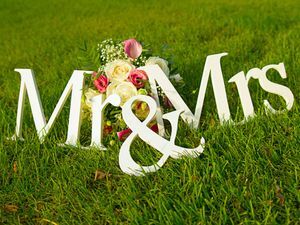 Most notably, the title Mrs. did not signify that a woman was married, just like Mr. today. In fact, Samuel Johnson’s dictionary of 1755 offers six definitions for the word mistress, which range from the respectful (“a woman who governs” or “a woman skilled in anything”) to the ironic (“a term of contemptuous address” or “a whore or concubine”), but no definition mentions marital status. The use of Mrs. to refer to a married woman is linked to the history of another title: Miss. Miss became a popular title in the late 18th century and specifically referred to an unmarried woman (often a schoolteacher) of a high social status. (Originally, Miss was actually a title for young girls, while Masterwas the title for boys.) This, according to scholar Amy Erickson, caused a shift in the use of Mrs. to signify a married woman in the late 18th century and still informs our use of the title Mrs. today. How the pronunciation of mistress turned to “missus” is somewhat unclear. Erickson cites John Walker’s A Critical Pronouncing Dictionary, and Expositor of the English Language from 1828: “The same haste and necessity of dispatch, which has corrupted Master into Mister, has, when a title of civility only, contracted Mistress into Missis.” The change in pronunciation was essentially a colloquial and utilitarian shortening, and by the tail end of the 18th century, this pronunciation was the preferred one.